A young woman is looking at her reflection in a mirror. She is wearing an uchikake decorated with pine trees over her kimono decorated with dandelions and baskets. There is a second version of this print signed by the nearly unknown woodblock-print artist Hasegawa Yoshishige. Yoshishige’s print depicts the onnagata Sanjō Kantarō II in the Soga drama that premiered in 1728. A courtesan is looking at herself in a mirror. She is wearing an uchikake with pine branches and twigs over a kimono decorated with dandelion plants and baskets. The woodcut and a leaf from the rare master Hasegawa, Yoshishige, are both based on the same model. 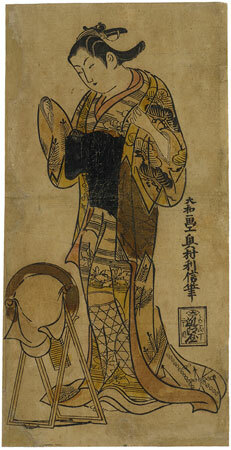 Yoshishige’s leaf depicts the actor Sanjô, Kantarô II in the role of Oiso-no-Tora, the mistress of Soga, Jûro, who teases a little kitten with an origami crane. Kantarô played this role in a Soga play in the Nakamura-za theatre in the year 1728. The handling of the lines is more or less identical in both woodcuts, but the patterns of the materials and the facial expressions differ.